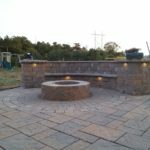 There are several different types of fire pits to choose from and the key to selecting the correct one for your yard is look at what you will be using it for and incorporating it into your outdoor space. The most common and simplest type a fire pit is a wood burning unit. This fire pit can be set up practically anywhere (as long as it is to local code) and does not require anything extra to get going. The smell and sound of a wood burning fire is something you cannot replicate. There are some negatives to a wood burning fire pit, mainly the smoke and sparks. Also, wind and rain can affect your fire burning experience. Some towns or cities do not allow wood burning units at all and this is where propane and natural gas units can solve an issue. A propane fueled fire pit has many advantages over a wood burning unit. With propane there are no sparks and not smoke. A propane fueled fire pit will stay lit in any weather and with the stainless steel inserts that we use, can be started with the push of a button and set up very easily. Also, propane is more efficient than natural gas, providing more BTUs than the same volume of natural gas. However, propane is more expensive and you must decide on where to place/hide the tank. A natural gas fueled fire pit shares many of the same qualities of a propane unit. We use the same insert as with our propane units, so it stays lit in wind and rain, starts at the push of a button, and last a lifetime. The advantage that natural gas units have over propane fueled units is there is no tank to hide. The line is run underground directly to the unit, making for a very clean and neat installation. Fire pits come in round, square, and rectangular sizes. 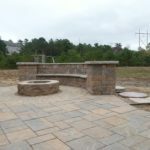 Over the years we have learned that the size of your fire pit will be determined by the overall design of your outdoor space and the placement of the fire pit. Also, with today’s modular units and inserts, creating a custom size and shape fire pit is easier than ever. So if you don’t see something in a catalog that you want, we can create one for you. 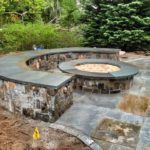 At the moment, there are very few regulations concerning fire pits in Massachusetts if the unit is enclosed and wood burning. Over the years, we have tried to keep our wood burning fire pits at least 10 feet away from any permanent structures, property lines, fence, roadway, hedge, tree and overhead wires. If you choose to have a unit fueled by natural gas or a permanent connection to propane, then the building inspector and fire department must be contacted. These units need to be kept 20 feet away from any permanent structure or property line. The insert for these fire pits must be listed or labeled by a recognized product testing organization. 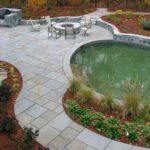 One other thing we have learned over the years is that some homeowners’ associations have rules that differ from local code and should be taken into consideration before starting your fire pit project. 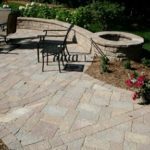 There are numerous options made by concrete paving stone manufacturers such as Techo-Bloc, Cambrige, and UniLock. These units are pre-made units and designed to integrate seamlessly with these companies’ paver and wall offerings. Natural stone fire pits can be created completely from scratch using full stone or a veneer stone. Natural stone fire pits give you the ability to create a custom fire pit, with the material and size that you want. 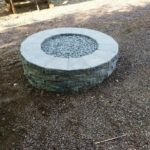 Do I need a building permit for creation of my custom fire pit? If we are constructing a wood burning fire pit a building permit is not required. If we are constructing a unit that uses a permanent line to an onsite propane tank pr a natural gas connection, a permit will be pulled and the fire department will be notified to discuss any other necessary considerations. 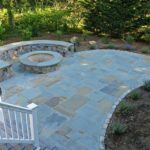 Contact Sheridan Landscaping for a free estimate on our fire pit design and installation at (774) 413-5012 or fill our contact form to get immediate assistance.